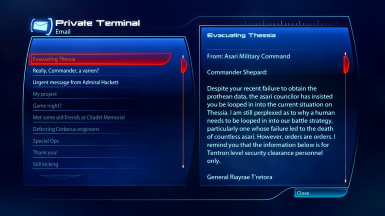 Replaces the very annoying email from Kai Lang with one that is actually from Asari Command. Kai Leng is one of the most hated characters out of the entire trilogy. I'm pretty sure all players can agree on that. 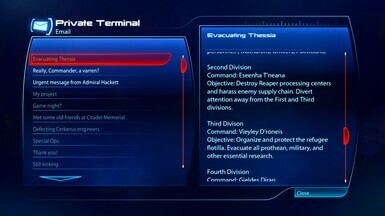 The email he sends you after Thessia is particularly annoying. It is probably one of the most childish things in the trilogy. That is where this mod comes in. 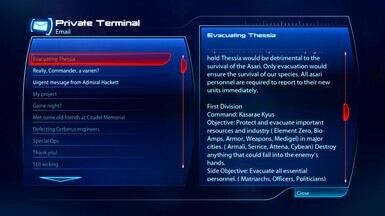 Now, you actually get an email from Thessia command after Priority: Thessia. The email does berate you a little bit for failing, but nowhere as crass as the original email. 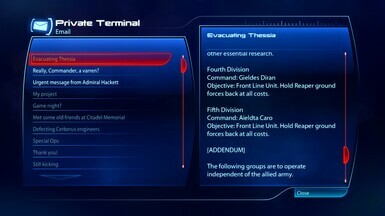 You will also be looped in into the evacuation plan of the Thessian forces. 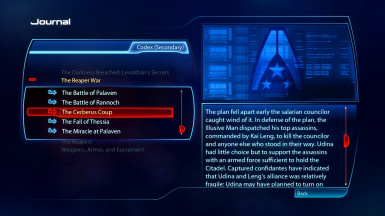 In addition, this mod fixes one lore mistake in the codex. 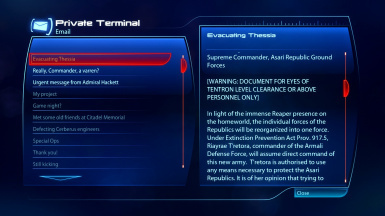 It removes any mention of Executor Pallin from the Cerberus coup entry in the Reaper War Section, who is long dead by the time of the coup. Future plans include adding emails from Miranda, Jack, Kelly, or Hannah Shepard post Thessia depending on romance conditions or character background. Installation should be simple due to the mod being a DLC mod. 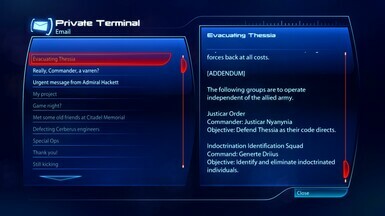 Just put DLC_Mod_KEmail in Mass Effect 3\BIOGame\DLC. I have also included the moddesc.ini for Mod Manager users. The following people were also essential to the making of this mod. and easy. This would not have been possible without that program. Me3 Explorer Team: For making the other tools necessary for making this mod. All the names of the generals and the names of some of the cities were made up by me. If you are uncomfortable with this then skip this mod. This mod should be compatible with just about every mod out there. This includes mods like EGM which revamps the email system of the game. Kai Leng Email Remover will only work with English localization games only. It does not work with any other localizations and I will not support you if you do use another language.